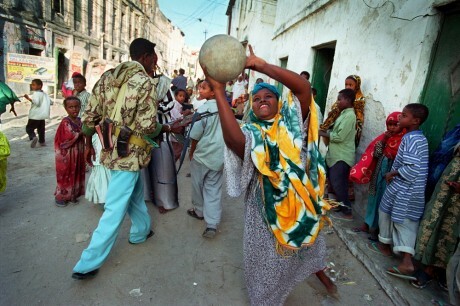 A young woman plays volleyball in the streets of Mogadishu, Somalia, as children are shooed away by a militia man attempting ‘crowd control’ in the Hamarwein quarter. Two decades of conflict between warlords supported by heavily armed militias has left the country’s infrastructure in ruins and destroyed most sports facilities. Yet against the odds Somalia has two athletes in this year’s Games. Zamzam Mohamed Farah will compete in the women’s 400 metres and Mohamed Mohamed Hassan will take part in the men’s 1,500 metres. Such a powerful photo! With that gun at the background, the smile of the girl with that ball in her hand sends a strong message that life’s always going to truimph over fear. Loved it!